One Folk Blouse, Three Generations – Hand Embroidered Folk Blouses NOW in Shop! This is a great moment for my little boutique as I found a supplier for authentic hand embroidered folk blouses – both new and vintage!! There are some sizes available in shop but the new ones can be made to order especially for you, upon request – in your size and preference of color combinations. My supplier is young and vibrant Oana Tepes who agreed to share pictures and memories with me so I could make a proper introduction for her beautiful blouses. Oana in her grandmother’s hand embroidered folk blouse. Who are you, Oana and what do you do? I started with a news blog a year and a half ago but the folk blouse project – collecting new and vintage folk blouses and giving them back to fashionistas everywhere – is one of my dreams come true in the lucky 2013! Why? Because I adore fashion and because I’m proud of my roots. How did you come up with the idea of making and selling traditional embroidered blouses? I was born in an extraordinary family, in an amazing place. Both made me who I am today! My family is rich in soul and my home is a mountain Moldavian-Transylvanian village, Bicazu-Ardelean. From my parents and my grandparents I learnt what a job well done means. I grew up with beautiful stories about life and people. I remember that as a child, every Friday night my mum, my sister and I would go to my grandmother Silvia’s home for a workshop. We used to knit, sew, spun… We spent hours of working with our hands and laughing a lot! What wonderful times! So, since I was a child my mother made clothes for us using her hands and her soul: sweaters, gloves, socks, blouses, scarfs. 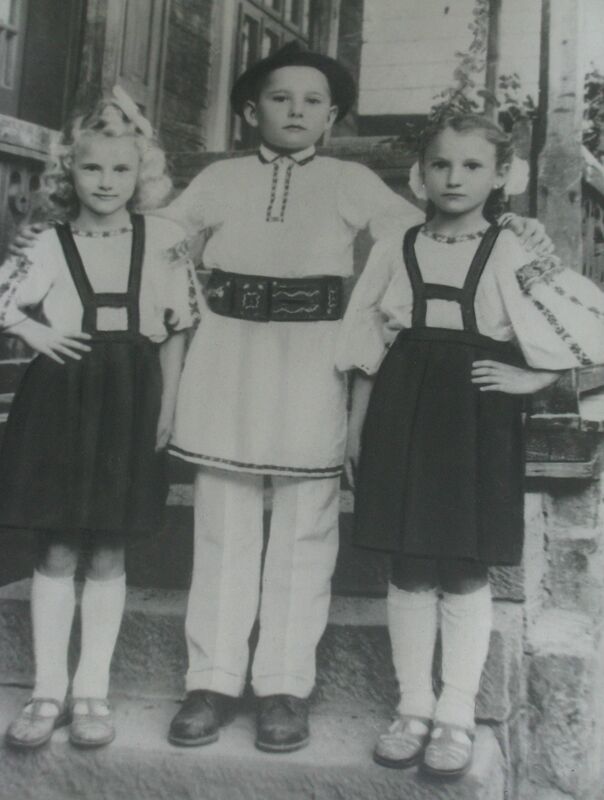 Oana’s mum with her siblings, wearing folk blouses made by their mother. But let’s go back to the folk blouses! The Romanian blouse has a history in my family. For generations, we got married in a traditional folk blouse. The bride made her own dress and also the grooms’ costume – look a the photos! My grandmothers and my mum used to make a folk blouse for every special occasion (Christmas, weddings, Easter): a unique, new blouse made with soul! That is why my grandmothers have now real treasures in their closets, beautiful authentic folk blouses with amazing embroidery and a bit of their own souls. They are vintage but look amazingly fresh and fashionable even after 60 years! Nowadays, girls don’t have the same patience to sew for weeks in a row, but they love this timeless piece of fashion. This is how I decided to renew the tradition and promote the authentic folk blouse for fashionistas everywhere. 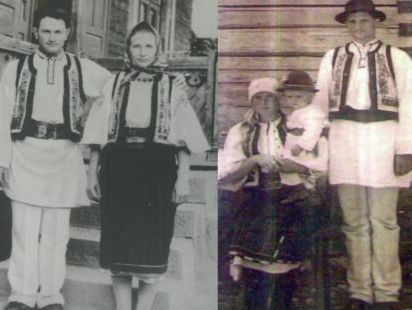 Oana’s grandparents, wearing their handmade folk costumes. Who makes the blouses and how? Our folk handmade blouses are made by the loving hands of many talented women, mothers and grandmothers from my village and other neighboring areas. There isn’t only one place where these amazing blouses come to life. For example, in my village the folk blouse has a very specific design. It is made out of canvas and it has many frills sewn together at the neckline giving it a lot of volume and shape. The folk blouse from other regions has “altiţa”, the handmade embroidered – floral or geometrical signs – on the sleeves and is made of thin, see through linen. The designs are passed from generation to generation while the embroidered patterns are virtually infinite and depend on the skill and inspiration of the maker. In the end, all we need is patience because such a blouse takes 3-4 weeks from start to finish! Vintage hand embroidered blouses available now at folklorique. We have many plans and dreams! An online shop with Romanian blouses and other beautiful traditional products for fashion and for home. And why not, reinvent the folk blouse in different materials while still wearing the same ancient patterns. 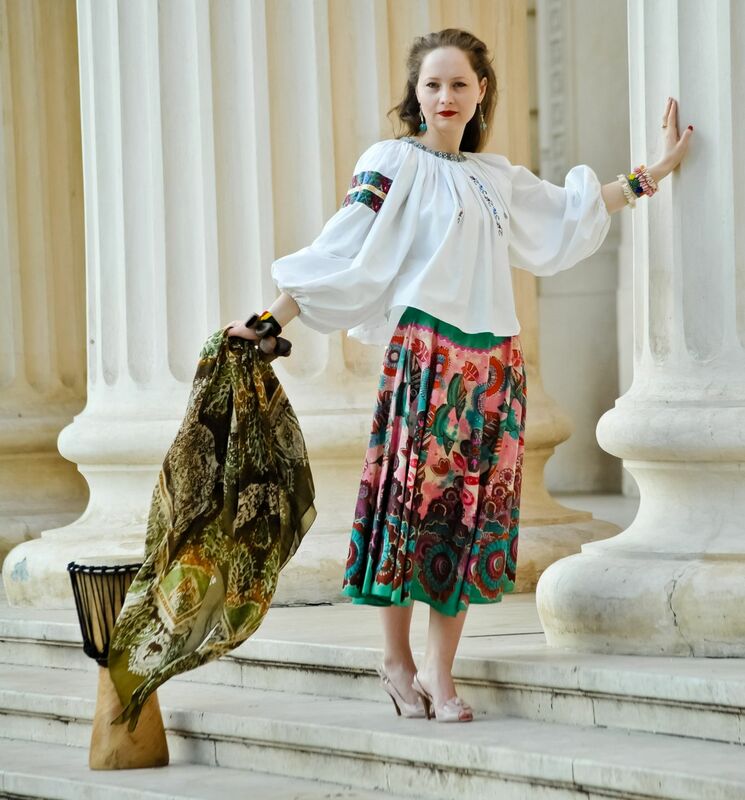 After all, the folk Romanian blouse is a masterpiece, it’s unique all over the world and needs to be preserved and passed to the next generations. First of all I want to tell you that my complete name is Oana Ţepeş-Greuruş, yeah, just like Vlad Ţepeş, count Dracula! Everybody knows the legend, but hey, what can I say, our blouses are bloody beautiful and precious! Secondly, it’s not surprising, but I love to write poems and stories. Why not visit folklorique shop now to see the pretty folk blouses available?! We still offer free UK delivery and a 15% discount on your shopping if you register for our newsletter.